Our customers are our biggest priority, which is why we will always go the extra mile. We can cater for all of our customer’s needs, even those with niche requirements. We aim to contribute to the economic, environmental and social well-being of our customers, suppliers and the communities in which we operate. Looking after the environment is part of who we are. In continuing our mission to work towards a greener future, we offer secure disposal and recycling of your PPE. We are working in partnership with leading secure destruction specialists to provide a national service for secure destruction and recycling of all types of PPE. This protects your brand and improves your carbon footprint. 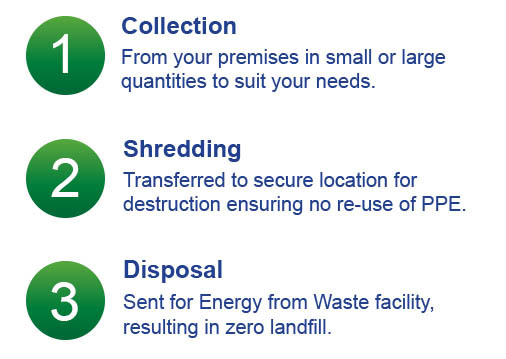 All material can be collected from your premises and taken to a secure facility where it is destroyed using a shredding process. It is then used as Energy from Waste (EfW) and converted to Refuse Derived Fuel (RDF) to generate power. A certificate of destruction is issued along with recycling weights and figures for each collection, ensuring you can prove that it is destroyed and recycled.